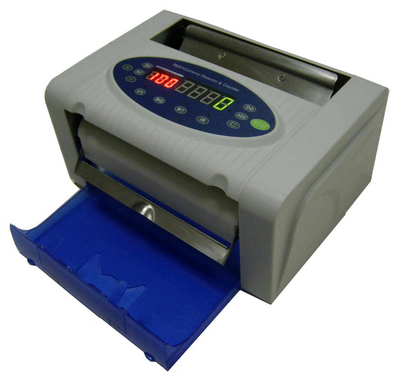 Golden-100 banknote counter is a portable currency counter which built-in a high quality MCCD (Multi Currency Counterfeit Detectors). When turn on IR, MT, MG and UV functions, it can 100% recognize the counterfeit notes of EURO, GBP and RMB. Portable, Intelligent counterfeit detecting, Low Noise and work stably are Golden-100 special features. Golden-100 machine equipped with backup battery (Options), the suitable occasion that not fixed, it is more flexible and convenient and portable. Sheets free counting and batch counting function. 11) Power Source: AC100 V ~ 230V, 50 - 60 Hz or Rechargeable Battery (Options).